When a customer did a search on the Web for Nine Output Head our AutoDrill Multiple Spindle site came up as one of the lead search results. The customer had a unique problem, to turn nine adjustment dials the same "EXACT" amount to keep a process in synchronization. 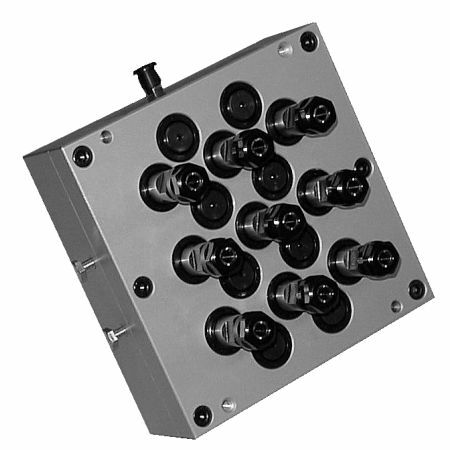 Since our multiple spindle heads are usually geared One to One,a small change to the input shaft results in nine equal output changes. This characteristic provided the solution to the customer's adjustment problem without resorting to a engineering project and with our guarantee and fast delivery. The head was made with the output spindles in exactly the positions needed to connect to the adjustment controls.